The Bundle-Maker add-in can be installed for Microsoft Word for Windows. For Word 2007, 2010, 2013, 2016 and 2019 (including Office 365): Click here to download Bundle-Maker version 5.9.1, released 04 March 2019 [1.8 MB file]. Either 'Run' the file BundleMaker.exe or 'Save' and then open the file. 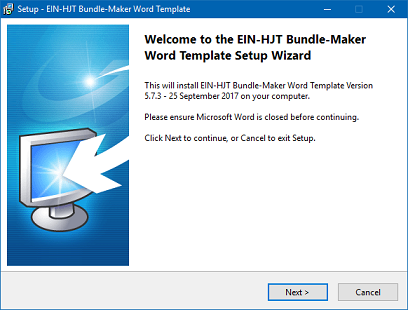 Follow the instructions on the installation program to install the Bundle-Maker. Please ensure Microsoft Word is closed when you install. The Bundle-Maker is signed by an extended validation (EV) DigiCert security certificate by Hillier Jones & Teale Limited (the software's authors) and this is added to your trusted publishers when you first install the Bundle-Maker so you shouldn't see any warnings when installing or when you open Word after installation, but if you do, please click here for instructions on what to do. Please report any problems you encounter using the Bundle-Maker to hjt@hjt-research.co.uk. Changes some icons in the Bundle-Maker ribbon to ensure full compatibility with Office's new icons. A few bug fixes and minor new features, including a separate 'page setup' dialog with the ability to fine tune margin measurements; Heading 1 automatically set to black text. PDF page count function gives more specific error messge upon failure. Improved 'Options' dialog that includes the option to place the key passage index as the first item in a bundle.